There have been plenty of reasons to sell stocks since the end of the financial crisis in 2008. The drumbeat seems to be getting louder as the postwar market advance approaches one of the longest on record. Also contributing to some angst about the market's advance is the fact the last pullback/correction of greater than 10% occurred in February 2016. In other words the market has gone more than 16 months without a >10% pullback. 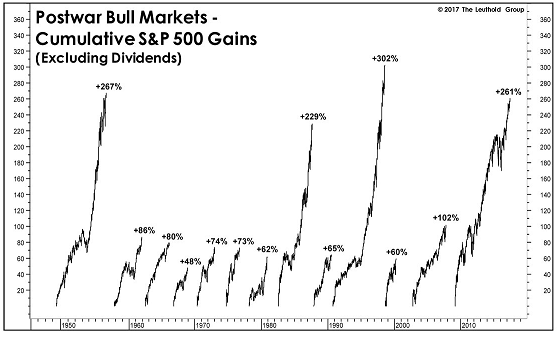 As the below chart shows, market pullbacks of nearly 10% are a fairly common occurrence. The market's average intra-year decline equals 14.9%. The first six months of the year are nearly behind us so I thought it appropriate to provide an update on the performance for the 2017 Dogs of the Dow. As noted in the past, the strategy is one where investors select the ten stocks that have the highest dividend yield from the stocks in the Dow Jones Industrial Average Index (DJIA) after the close of business on the last trading day of the year. Once the ten stocks are determined, an investor invests an equal dollar amount in each of the ten stocks and holds the basket for the entire next year. The popularity of the strategy is its singular focus on dividend yield. The strategy is somewhat mixed from year to year in terms of outperforming the Dow index though. Over the last ten years, the Dogs of the Dow strategy has outperformed the Dow index in six of those ten years. Since my last update a few months ago, the Dow Dogs performance has fallen further behind the Dow Jones Industrial Average Index. As can be seen in the below table, the average return of the Dow Dogs through 6/16/2017 is 4.9% versus the DJIA return of 9.4%. Interestingly, in the top ten performing stocks in the DJIA index this year, only two are Dow Dogs, Boeing (BA) and Caterpillar (CAT). Boeing is the best performing Dow stock, up 28.3%. So far this year, energy has been a drag on the both the DJIA index and the Dow Dogs, while at the same time, industrial stocks have been performing well. In short, the sole focus on dividends in the Dow Dog strategy has yet to pay off this year. Of course the big news last week was Amazon (AMZN) announcing it was acquiring Whole Foods Market (WFM) in a deal valued at $13.7 billion. The deal is an all cash one, but with Amazon's stock trading at a trailing price earnings multiple of 185 times one might think funding the purchase with stock might make more sense. Nonetheless, this acquisition announcement had ripple effects on many other consumer product companies and not just grocery retailers. One question that arises is whether Amazon's purchasing leverage will put downward pressure on prices for products manufactured by the likes of Procter & Gamble (PG), McCormick & Company (MKC), Kellogg (K) and many other packaged consumer product companies. Friday's stock market reaction to this broad category of companies suggests the AMZN/WFM merger will be a significant headwind for other companies in this space or to those selling into the space. Personal Delivery: Our knowledgeable Route Sales Representative will deliver your food to your home at a time that is convenient for you. Drop-Off Delivery: No need to be home for delivery. We'll drop off your order at your scheduled delivery time in a reusable freezer bag that keeps your food frozen for hours. Mail Order: Mail Order delivery is available anywhere in the continental United States. It's a convenient option if our delivery service is not available in your area or if you want to send our food to family or friends. 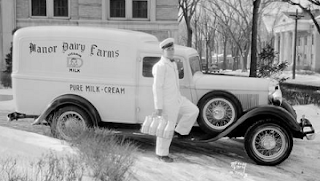 More background on Schwan's can be found at this link. At the end of the day, the success of any retail store is centered on the customer having a positive experience and the store or business executing on its business plan. And to this end, brick and mortar retailers need to make 'positive customer experience' an overriding aspect of their business model if they want to compete with the Amazon's of the world. I could, but won't in this post, list a number of procedures retailers have implemented that do not contribute to a customer having a positive experience. I am skeptical of how successful the delivery of groceries can be. 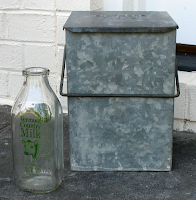 As I stated earlier, home delivery of groceries is not the same as leaving a non perishable package on the doorstep. A benefit Amazon is getting with the Whole Foods acquisition is access to 400 plus brick and mortar locations. Is Amazon then saying brick and mortar is a necessity in order to continue its growth? 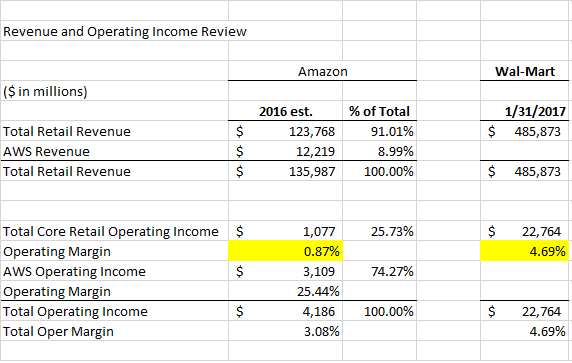 So long as the market continues to give Amazon a pass on generating a decent profit from its businesses outside of AWS, AMZN's retail competitors could continue to face challenges. However, I do believe that the AMZN/WFM acquisition may not work out as well as AMZN anticipates. Selling groceries and adding delivery cost on top of a low margin business, is not a recipe for fast growth in my view. 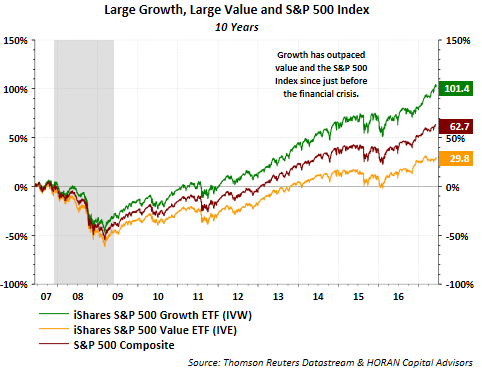 Over a long enough period of time, value stocks tend to outperform growth stocks and this fact is causing some pain for the value oriented investor during this market cycle. In a Fidelity article that compares value versus growth performance, this has indeed been the case when going back over 25 years. The Fidelity article shows, however, that on a risk adjusted basis the growth style wins out. The value style tends to have a large weighting in financial and economically sensitive sectors and most investors know these types of sector positions experienced headwinds in the 2008/2009 economic downturn. "SPX [S&P 500 Index] has now avoided a 5% drawdown since November 4, a period of 139 days. Since 2009, there have been only two uninterrupted uptrends that have lasted longer: 142 days (ending January 2014) and 158 days (ending September 2014). If past is prologue, then SPX appears likely to have a 5% correction before June 23 (158 days)." I am not sure time in and of itself is a predictor of a 5% equity market correction, but the data is confirmation of the lower downside volatility recently experienced by the equity market as can be seen in the below chart. The individual investor continues to express concerns for stocks when looking at their sentiment response. 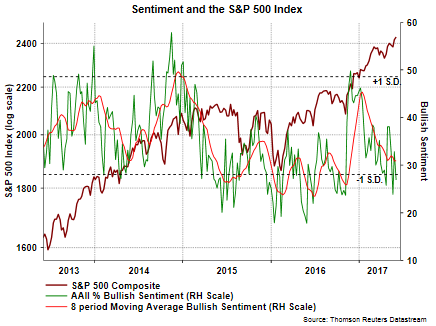 Yesterday's Sentiment Survey report from the American Association of Individual Investors showed a nearly six percentage point decline in the bullish sentiment reading to 26.92%. This pushes the bullishness reading one standard deviation below the average bullishness reading.